These crystals came to me more than a month after I announced the Soul Hara Class, which on one hand seems like an eternity ago, but came up during the summer. These crystals are the “crystals we have been waiting for”. They will not replace every crystal you use, for everything has a purpose. These crystals come from a mountain top in Colombia and are very hard to procure based on the rough terrain and altitude. Most of them are lightning struck and are referred to as ice crystals. Even though they grew in Colombia, the seeds are not Earth based. They hale from an ice planet and are formed in water as opposed being formed by combustion or compression. Those who have seen these ice crystals at the source describe them as having a blue glow from the ice. These crystals exist in a glacier that never melts or as time would show, go back to the last ice age. They have a connection to the dimensional beings known as “Blue Star Healers”. These beings are summoned via a 2012 Sirius Grid. They already are described as having a vibration higher than anything we have ever experienced. 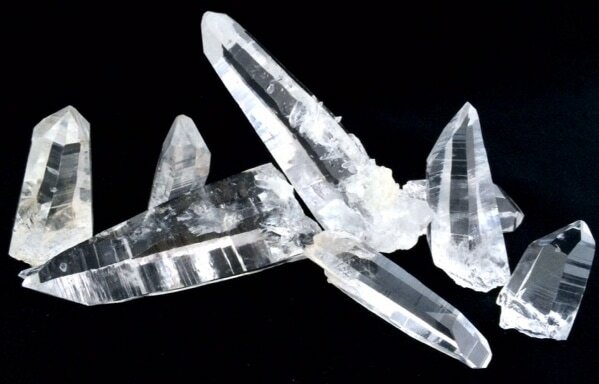 They possess qualities higher than the combination of Phenacite and Russian Lemurian quartz from the polar Ural Mountains. Sentient means consciousness. Anything has consciousness, but these crystals have a super consciousness. They have knowledge of all 12 dimensional realms, especially nine through twelve. Sentient crystals feel you as much as you feel them. They have an awareness as if entities from other worlds are watching you. They diagnose as well as repair and restore one’s sense of purpose. They enhance the connection with the soul and enhance rapid spiritual evolution. They radiate universal love and balance the grids. They show one how to heal themselves via deep introspection and meditation and connect past lives to current lives. They promote growth on all levels. They create rapid change and quick evolution and give us knowledge of technological advancements. A plasma is a gas that has been energized to the point that some of the electrons break free from, but travel with, their nucleus. Gases can become plasmas in several ways, but all include pumping the gas with energy. A spark in a gas will create a plasma. A hot gas passing through a big spark will turn the gas stream into a plasma that can be useful. Plasma torches like that are used in industry to cut metals. The biggest chunk of plasma you will see is the sun. The sun's enormous heat rips electrons off the hydrogen and helium molecules that make up the sun. Essentially, the sun, like most stars, is a great big ball of plasma. Plasma quartz charges and coats everything it comes in contact with. When the plasma crystals are placed in the nine point grid they charge each other and, like ice coming in contact with something warm, they “melt” and encase whoever is holding them. The recent term I used to describe what I saw in the session was “Cryogenic Incubation”. Every time I witnessed someone wrapped in Plasma Quartz they seemed to experience perceived antigravity due to the effects of the plasma. When these crystals were offered to me the intention and direction was made very clear. They are to be shared and used for healing. They are not meant to get into the wrong hands or for anyone with ill intent. They are not to end up in museums or on the shelves of private collectors, collecting dust. The intention is to grow our consciousness and learn from them. The beings behind these crystals are using us for remote viewing and we will know what we need to know as we evolve. As much as these crystals are broadcasting, they are receiving and collecting data and broadcasting to others.